Elevated Roofing’s free professional roof inspection gives homeowners an accurate assessment of their roof’s overall condition. Our expert roofers will look for hail damage, missing, curling or blistering shingles, missing or cracked caulk, rust spots, worn or cracked boots, moss and beyond. We’re licensed, insured and bonded. 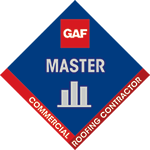 We are accredited by the Better Business Bureau with an A+ Rating and we hold a GAF Master Elite® Certification. Schedule your free roof inspection today. Fill out the form below or call us at 469-305-0010. Whether it’s time for a new roof for your home because your old one has worn out, your roof is leaking and needs to be repaired, a storm rolled through and you’re not sure what kind of damage the hail and wind caused your roof, or if you’d simply like a new color or style for your roof… we’re here to get the project done right the first time. Request your free inspection today.